The strikingly Hwajodo “flowers and birds” motif used by Yi Han-Ch’ol (1812-1902) reveals a meticulous attention to detail and testifies to the artist’s acute sense of observation and realism. The subjects are depicted with extreme delicacy and lightness of touch yet do not lack precision. Skillfully adopting a technique inherited from Ming dynasty China (1368-1644), the painter plays on the contrast between a dark blue background and the silver strokes of the composition. Some of the motifs featured here, notably those of the ducks and the phoenix, also appeared in the same period in a style known to some as Minhwa. 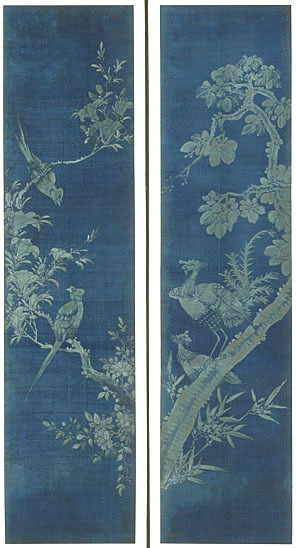 The traditional “flowers and birds” theme, in this instance treated in a highly decorative, poetic vein, was a genre inherited from Song dynasty China (960-1279). Under the Yi dynasty in Korea, this genre became one of the five categories (along with bamboo, landscape, animal painting and portraiture) included in the entry competition for the Academy of Painting. Here, Western influences seem evident in the exploration of volume and the rendering of depth. On the other hand, the remarkably classical set of themes and the pervading naturalism that prevail in this painting had been abiding features, firmly rooted in Korean sensitivity, since the Koryo period (918-1392). The right-hand panel of the screen is signed Hui Won, pseudonym of the painter Yi Han-Ch’ol, a high-ranking official and member of the “Office of Arts”. A master who was both respected and highly praised in his own lifetime in all the categories practiced by the Academy of Fine Arts, he is known for his genre scenes painted in a scholarly style as well as for his official portraits. He belonged to that generation of artists who experienced the first contacts with the West.